​​​​​​ TEXAS – Niche has released its 2017 Best Cities to Live in America​ list. 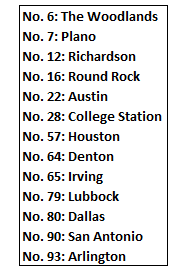 Thirteen Texas cities were ranked in the top 100. While compiling the list, the percentage of residents who have a bachelor's degree or higher was weighed the heaviest by Niche. Other factors, like nightlife, crime and weather were also used to compile the list. ​See Austin, DFW, Houston, and San Antonio​ Market Overview Research.